As a campaign to help bring businesses to the next level, Cebu Business Month (CBM) 2017 has lined up a host of activities that seeks to equip companies with the tools they need for growth. Melanie Ng, Cebu Chamber of Commerce and Industry (CCCI) president, said during the CBM 2017 Grand Opening Salvo last Friday that the month-long event aims to inspire businesses to contribute to the competitive advantage of Cebu in the global economy through development in the areas of entrepreneurship, productivity, and technology. CBM 2017, which marks the event’s 21st year, carries the theme “Step Up Cebu” for Sustainable Technology, Entrepreneurship, and Productivity for the Upliftment of Cebu. CEBU BUSINESS MONTH. Cebu Chamber of Commerce and Industry president Melanie Ng (4th from left) and Cebu Vice Governor Agnes Magpale (6th from left) flank CCCI brand ambassador Kenneth Cobonpue as they lead CCCI officials during the opening of the annual Cebu Business Month. Charles Kenneth Co, CBM 2017 chair, said the month-long event that serves as the yearly highlight for Cebu business is ready to help entrepreneurs who want to expand their business, tourism stakeholders who are looking to entice more visitors, and startups who dream to become the next big thing. During the event, Ng also announced the selection of Kenneth Cobonpue as CCCI brand ambassador. The choice of Cobonpue was in line with the business group’s quest to increase awareness among members, especially millennials, of CCCI’s vision and mission and to have someone represent the best of Cebu with the rest of the world. She said the world renowned designer embodies the chamber brand, one that is homegrown but global. 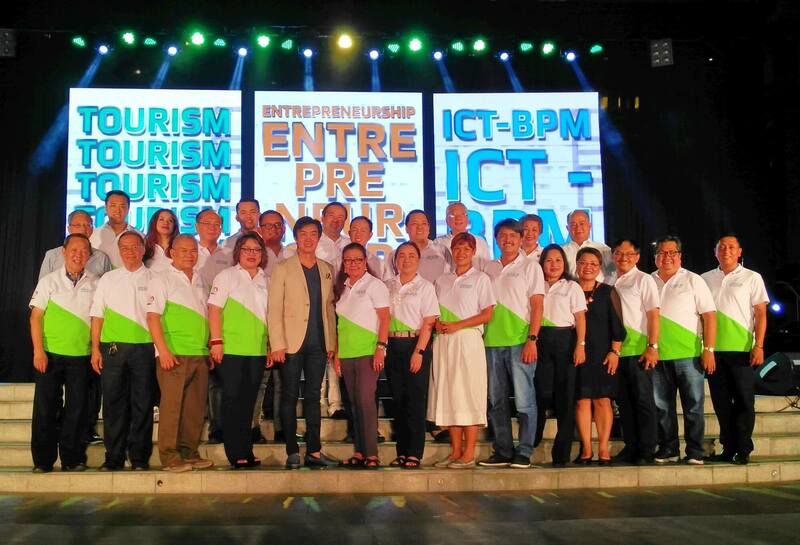 Also during the CBM 2017 Grand Opening Salvo last June 1, business executives unveiled the business group’s priority focus areas of tourism, entrepreneurship, and ICT-BPM.